Hey guys, did you realize that this is a zombie thread from 2013. Guess that would make it the 13th anniversary now. glad i didn't make the candles. doh! this quote is from this year looking for help. I'd need more info on exactly what is meant by "DIM will not operate" ,. and why that's an issue. it has nothing to do with morphs, or how the installed files work with a program,. You can Manually download you content from Your Library, in you Account,. and install those to your daz3d Library,. or a custom location. If the issue is that you've installed a product which has morphs,. but the Morphs don't work in Carrara, or don't appear in carrara,. then it's most likely an installation issue,. If you're manually installing files,. that's more likey. FYI: Anyone whom has any sort of interest in Carrara, this compilation is truly a "Must Have"!!! 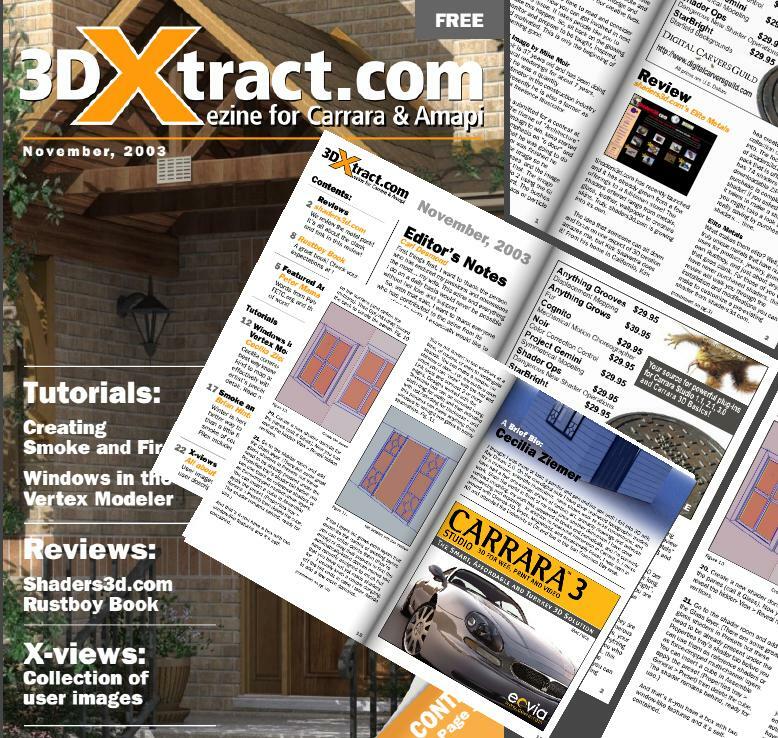 Packed with all manner of Carrara Goodness, 3DXTRACT Ezine collection, complete with working files to go along with the tutorials and such... you just owe it to yourself to download this! Thanks again, Carl!!! This image was made using the November 2003 ezine. Is that the first issue? I am glad this got brought up from the 'basement'.... and it was good to see Garstor, Evil and Dart again!! I have downloaded it... takes some time as it's a big file. Just on a lookover, there are some great basic skills in there. Grabbed it... can't wait to take some time to check it out. SileneUK, everyone can benefit from the skill. I will. Dart, thanks for showing a pic... got a chuckle from the DCG add mentioning early versions of Carrara Studio... I started with Carrara 4. I have downloaded it last night then will look at it soon. Amazing! Okay, I opened the pdf version of the index, since I'm not savvy enough to figure out what to do with an ".idx" file, so that I could sort my folders by adding "01 - " thru "18 - " prefix to put them all in simplistic numerical order. During this process, I couldn't help noticing "Mark Bremmer", "Mike Moir", and more. "ILM" caught my eye, so I opened up the November 2004 issue to have a quick look. Both Mike and Mark are also contributors to this issue as with Eric Winemiller of Digital Carver's Guild, whom is talking about features of his plugin "Ground Control", which I never knew existed in it! The magazine metions other features, like the fact that Grond Control goes beyond other height map conversion of grayscales, by allowing the conversion to result in Mesh, Terrain, Anything Grooves, or even the new Ground Control Primitive(!!! ), but Eric's cool tutorial is featuring a new function that GC adds to the Terrain editor, which allows us to use a Carrara Master Shader multiplied by a height to be added to whatever other terrain functions we have going on! Like his example of putting an ancient wall across the terrain, but the possibilities of such a thing is incredibly endless!!! I can't wait to read Mike and Mark's articles, as with all the rest. This whole series is certainly a cover-to-cover read! As Steven Tyler of Aerosmith sings: :I don't want to Miss a Thing!" Yikes! I've just finished reading the November 2004 Issue (had many interruptions in between) and I must say... this is an Excellent magazine! I haven't tried playing with any of the support files yet or messing around with any of the techniques taught, but having studied many of these approaches before, I can certainly testify to their value. Harvey White, Mike Moir, and Mark Bremmer have contributed some really nice information - and certainly a fine read! I've already mentioned, two posts up, that Brian, Eric, and Editor Carl have provided some awesome tutorials that stole my attention away - getting me to feel the urge to finish the whole e-zine cover-to-cover. I love the old ads, the imagery, the enthusiasm, the wonderful atmosphere of the publication... bravo! If this thing still existed, I'd certainly be a subscriber! I'll certainly be starting over from the beginning of November 2003, Issue #1, and reading them all, from cover to cover. I love this! 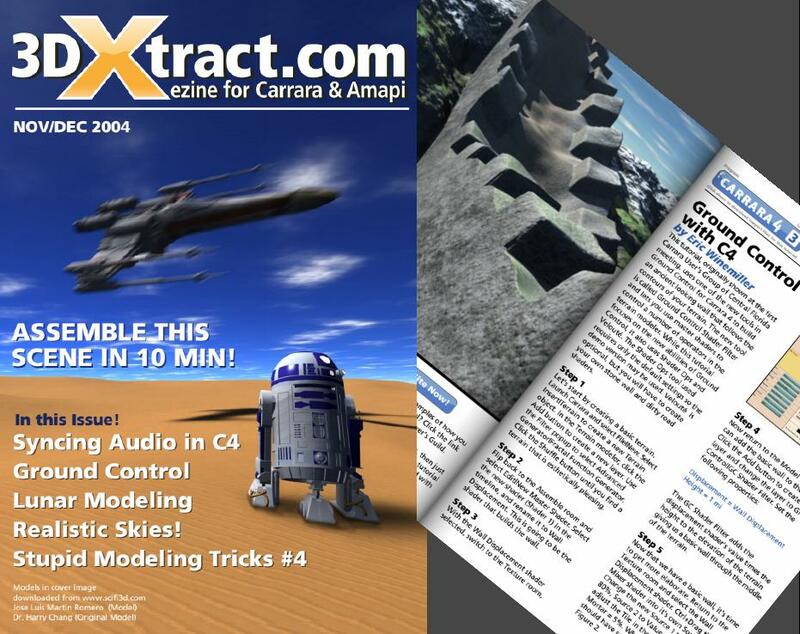 In this (November 2004) issue, Mike Moir is introducing us all to the all new Carrara 4 Pro Realistic Sky!!! Just priceless!